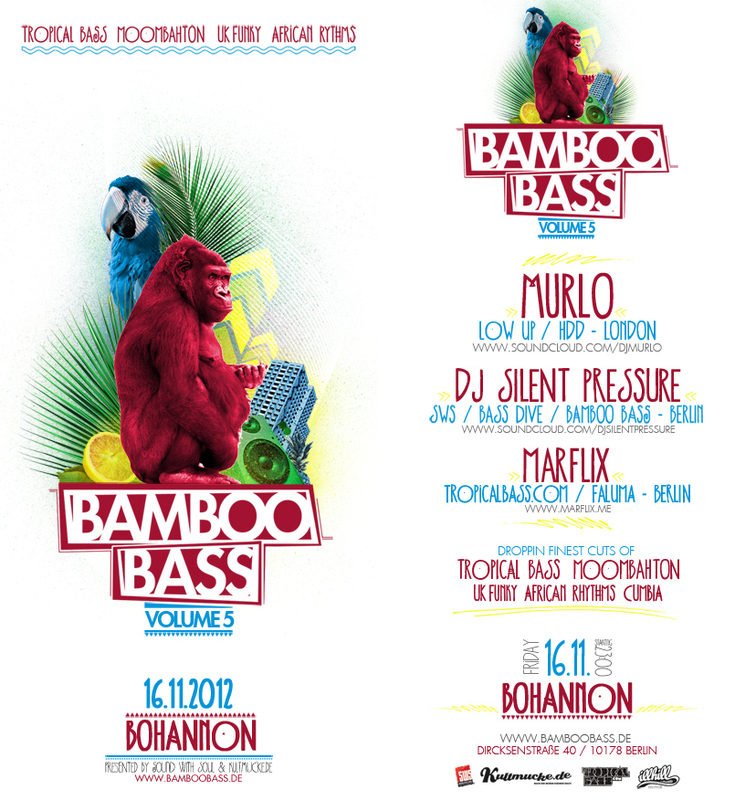 Bamboo Bass – Berlin’s Tropical Bass hot-spot is finally back with it’s fifth edition. Remember the last party with Uproot Andy when almost 800 people teared the roof down? Bamboo Bass is Berlin’s own Global Bass troop on their mission through the urban music jungle, loaded with the latest Tropical Bass, Moombathon, UK Funky and African club sounds – brought to you by SWS (Sound with Soul) in cooperation with Tropicalbass.com. For the 5th edition of the Bamboo Bass we are glad to present London’s finest – MURLO (Mixpak/Low Up/Hipsters Dont Dance – London) at the legendary club Bohannon (Berlin) this Friday, Nov 16th. As usual resident and host Dj Silent Pressure [SWS] released a new Bamboo Bass Mix packed with the latest tunes in Tropical Bass, Moombahton, UK Bass & Trap. Oye kids, this gonna get madd, so make sure you got your dancing shoes on.